Why do I have the Ghostbusters theme in my head now? I loved this post–I doubt I would have the patience to read and follow all the instructions, but I LOVE how bright the room is now! You go, mister! Who you gonna call?! I was 100% thinking about the ghostbusters theme while this was in progress!! Wow. Great job, enjoy the warmth. Thanks for READING the directions and all that protective gear. As your mom, that makes me SO proud. Also, finished job looks great and like it will definitely be worth the hard work you put into it. I can imagine how horrible it is without insulation. But if anyone is inspired by this method, do not do it. The product used to expand this is isocynate. Even though there is no residue in the final product you are promoting production of a chemical that is very dangerous to all water-living animals. There are also health-hazards with many flame-retardant chemicals used in polyurethane. Messes with the reproductive system and so on. Not to mention the increased risk of wood-rot when applying a plastic bag to the inside of an old house, a leak in the roof can go undetected too long. I hate to be so negative, I really do, and especially here, but at some point we need to start take responsibility for all the products we use in our homes. If anyone is inspired by this method I think it is important to know that there are eco-friendly alternatives that do not mean you build in a bio-hazard into your own home. Thank you for adding this perspective, Louise! You make many valid points that I did consider before undertaking this project, so I’d just like to speak to a couple of them if I may, mainly because I think and read about this stuff a lot and inquiry often leads to more questions than answers for me. You mention eco-friendly alternatives—could you go into greater detail on that? I’m aware of some insulation products made of recycled materials (like denim), but to my knowledge those tend to be loose blown-in solutions, which isn’t really an option for this kind of application. Working in this field, I’m often struck by the amount of waste any kind of construction or renovation work entails—a big reason why I’m so adamant about saving lumber rather than pitching it and buying new (it’s certainly not easier! ), since it’s realistically one of the VERY few things that can be reused. The environmental cost of building and renovating is large no matter how you cut it—that doesn’t mean there aren’t better or worse ways, but I don’t know of a truly “green” building method other than…not building at all. The environmental cost of being human and alive is large—so you’re absolutely right that we need to take responsibility for the products we use in our homes. To that end, I make various efforts: from reusing as many materials as possible, to trying to avoid trendy “disposable” kinds of renovations that’ll just get ripped out in a decade or two, to making various energy-efficiency upgrades, to literally shrinking the size of my house by removing unnecessary square footage that would otherwise need to be heated and maintained. But at the end of the day, I think it’s worth keeping in mind that eco-friendlier does not mean eco-friendly. None of this work is eco-friendly. None. No matter what. (I’d love to be corrected here, by the way) So it’s really a question of alternatives—in this case, leave the room uninsulated or use a different product, right? Uninsulated seems like a poor option to me for obvious reasons, including the environmental impact of the increased amount of natural gas I’d have to use to heat my house. Fiberglass, as far as I know, basically never degrades. 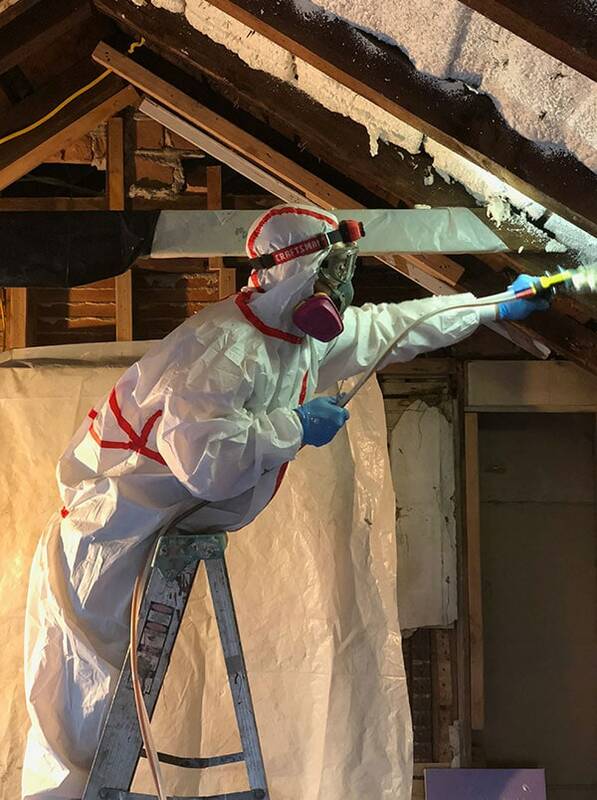 And while the increased risk of wood-rot is a real and documented thing with either improperly applied or improperly maintained spray foam, I think it’s also fair to say that a leaky roof is a roof issue, not an insulation issue—any leaky roof will eventually cause wood rot, which is why you replace your roof before it starts leaking. Taking fiberglass bat as an alternative, I can’t tell you how much fiberglass I’ve pulled out of walls that had either sunk down into the wall cavity (rendering it useless), gotten wet and compacted and grown mold (useless AND hazardous), or become a cozy home for a family of rodents who have chewed into framing and electrical lines (useless, hazardous, and damaging to structure/systems). Anyway. As much as this blog is about documenting what I did and why I did it, I’m here to learn, too. I genuinely want to make good decisions for my house, my clients’ homes, and help others at least be informed of their options when making materials decisions and whatnot—but we also shouldn’t be kidding ourselves that there’s a way to do any of this without creating an impact of some magnitude. Knowing how you preserve all old wood, I was very surprised you chose this method mainly because of wood rot risk. As alternative – I would have looked at fibreboards (pure woodfibre without additives, slightly soft material) + cellulose or paper pulp insulation (blown in between roof and fibreboard, compressed). However I have no clue how available that is in your area. 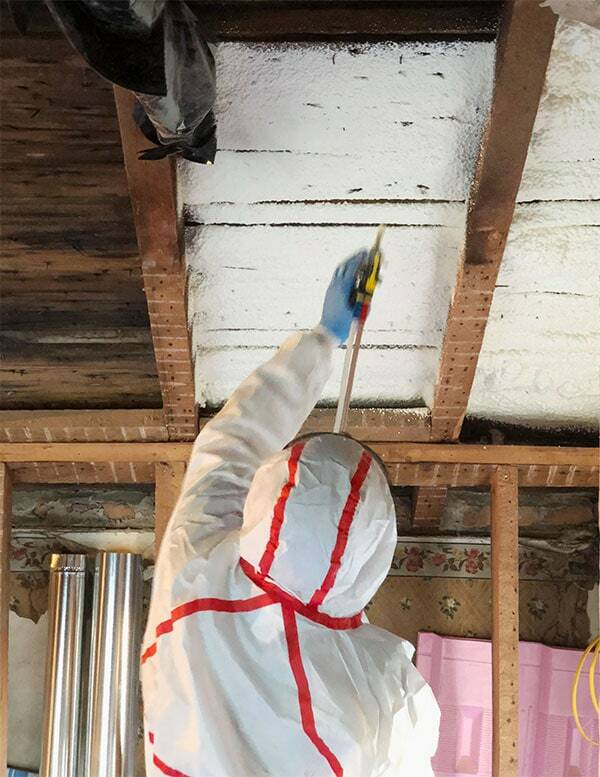 Dense-pack cellulose (not to be confused with loose cellulose) could have been a good option here – it’s environmentally friendly and potentially less hazardous for your wood framing if water does get back there. 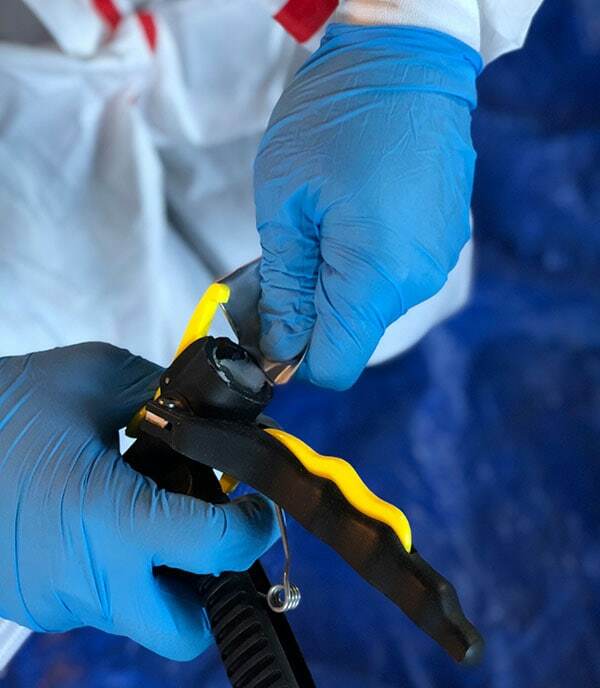 It sounds like you were concerned about how to blow it into open bays, but when the installers come, they staple a webbing material across your stud bays and then blow the cellulose into the cavity they have created until it is about as firm as a firm mattress. It doesn’t matter that the bays are all different sizes, they just poke a hole into the webbing on each one and fill it up. It’s all just recycled newspaper with some borax in it for pest and fire retarding – it’s actually much more fire retardant than your spray foam (here’s a fun building science video of burning up lots of different types of insulation: https://www.youtube.com/watch?v=8NC79e0oztM.). In addition to being recycled newsprint, cellulose doesn’t use any funky blowing agents like foams do. 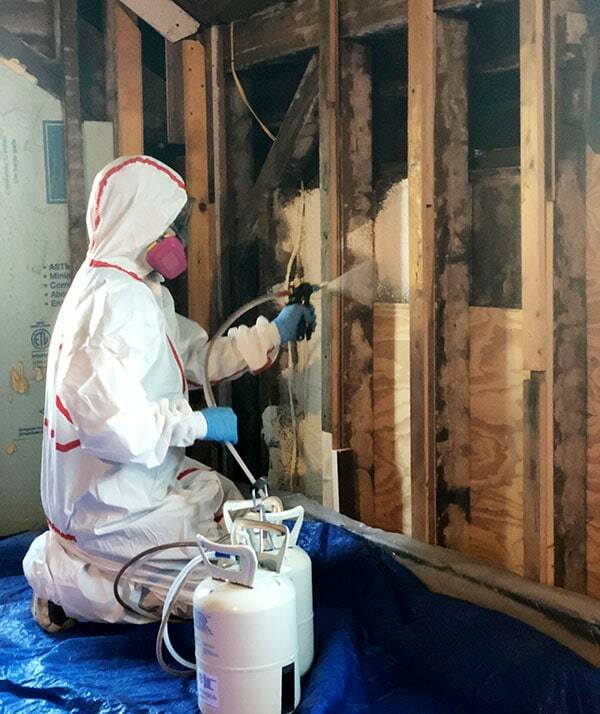 Cellulose is very hygroscopic, so if small amounts of water get into your walls, it will allow the moisture to dry back out – closed cell spray foam is even more of a vapor barrier than open cell foam, so if moisture gets in there, your framing will rot. Since you’ve done this, be extra extra careful about installing your water-resistive barrier correctly and flashing your windows properly. As far as R-Value, because you had to leave that gap in your stud bays for the closed cell foam and the dense pack cellulose completely fills the bays, you end up with a similar R-value. 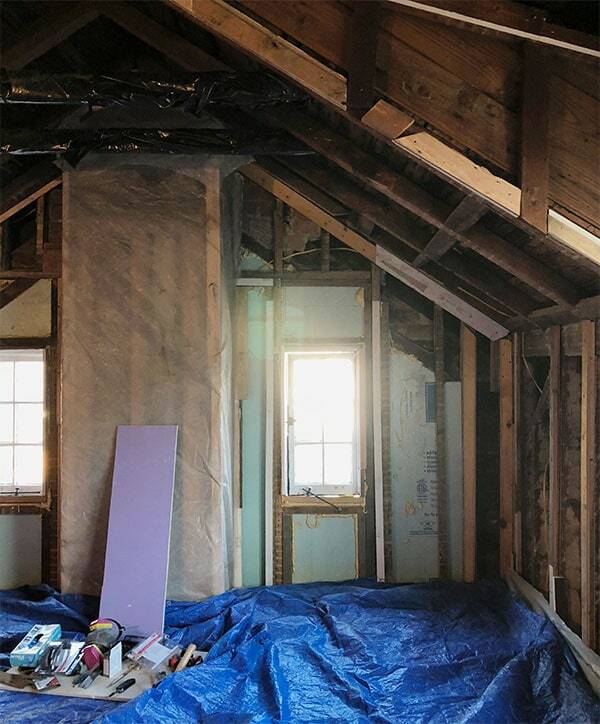 Dense-pack cellulose is also really cheap – you probably could have had someone come do your room for you for about what you paid for the DIY foam materials (speaking from VT, which is not too far from you!). A good application of closed-cell foam would be your basement – somewhere that there is lots of potential for moisture but where moisture won’t be trapped around wood. Another environmentally friendly insulation option is rock wool – made from slag byproduct from metal manufacture. It comes in both batts and boards, isn’t bothered by moisture, and is very fire resistant and more pleasant to work with than fiberglass batts. It isn’t as good a fit for this situation because of your uneven stud bays, but another option for others to consider. For further reading, I recommend Green Building Advisor – their forum is also full of experts who love to talk about this stuff! Good job Daniel, and like your mother, I am SO glad you didn’t skip over steps, read the directions etc BEFORE you did the project as SO many DIYers I think tend to do this, then wonder why the product failed or what have you and never blame themselves for rushing, botching the job by NOT reading/planning things through. Anyway, I bet you will feel a bit warmer, not just in your kitchen, but when in your den on a cold, frigid and snowy evening relaxing etc too. Right now, it’s 31F outside at 6:15AM here in Puget Sound and we’re only to reach 41F by end of day and it’s been brilliantly sunny too this week, but we’re to get into the mid to upper 40’s, starting tomorrow so not too bad, but dayum, a cold kitchen in the mornings so a hot shower gets me all warmed back up. Anywhoo, keep it up and you’ll get there, one project at a time! BTW, you seem to be going at this methodically by tackling the important issues, such as insulation first so you can at least do the next step (sheetrock), even if you don’t get the room completed for a few more years, but getting the place insulated is kinda important because it adds to the comfort factor of your abode and that’s the most important aspect of home ownership. It looks like a gingerbread house. I like that. I have been following your adventures for some time now. I too have been doing an extended remodel, by myself and with help from others. Everything you write has been parallel and true to what I’ve been experiencing, only you sit down and make it warm and fun and funny. Your stories are cathartic for me, so I thank you. Thank you! Yay! I admit, I paid someone to do it but our attic spaces (we have two distinct, one over the main house and another over the garage) have lots of angles so there was never any consideration I would do it! Our electric bill halved in the first month. Best thing we’ve done since moving in was to prioritize things like this (and replacing doors that also save money and energy!). I think you will be even more pleased as time goes on. That’s amazing!! Fingers crossed it’s a similar story here!! I am impressed! But reading your description makes me SO happy that I paid the professionals to do this work! 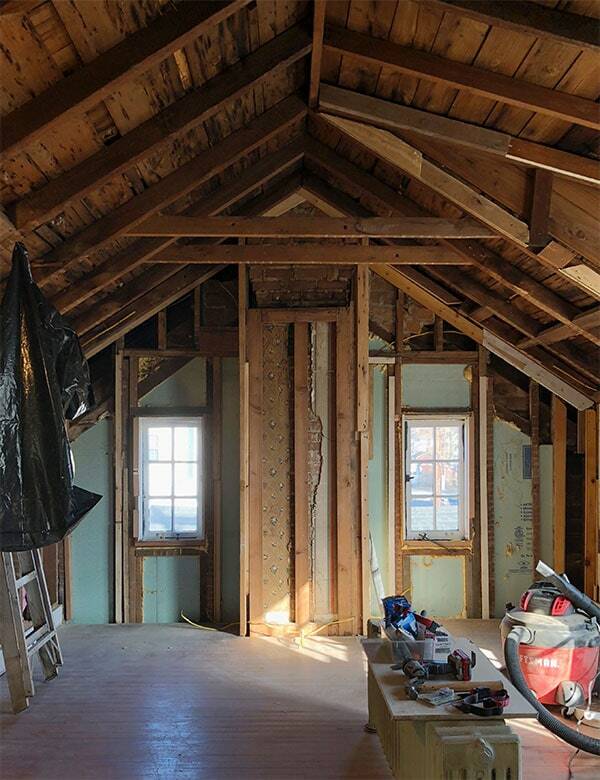 It will be exciting to see the finished room. Your posts make my day! I’ve learned so much. Keep up the good work, and writing! Awesome job!! 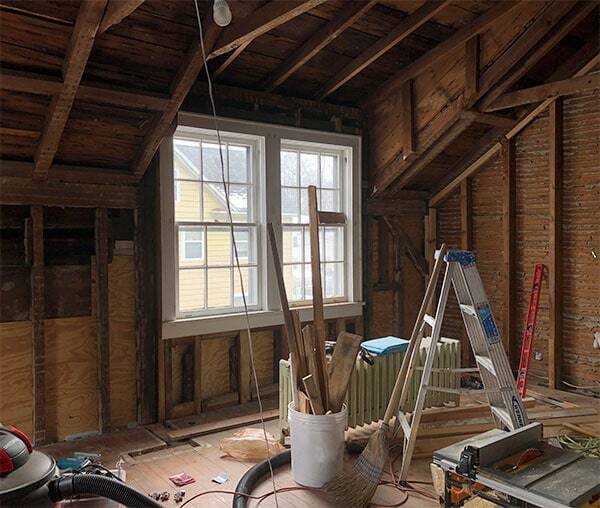 Can’t wait to see how you transform this room! Ahhhh, thank you for this post! 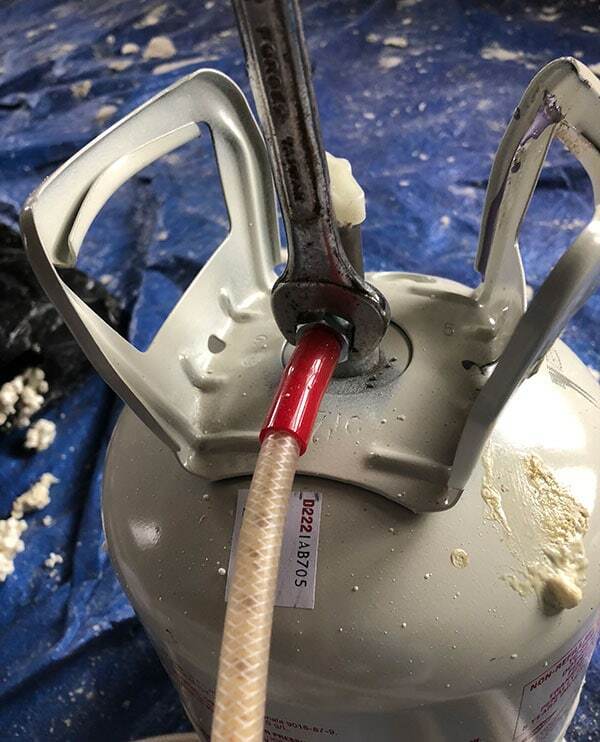 I’ve been wondering whether closed cell spray foam was something I could DIY for a while, since I’m also working on areas piecemeal as the budget allows. All of my old fiberglass batting has either fallen down between the studs, is moldy, or both. Gross. The application technique sounds a lot like using a paint sprayer, which was a serious learning curve for me. One of my contractor neighbors (aren’t those the best neighbors?) came over and showed me what I was doing wrong, which was moving my wrist when I sprayed. 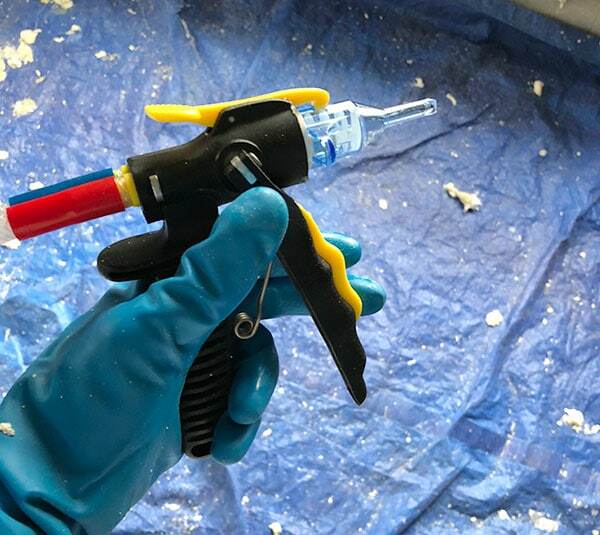 It definitely helped to focus on moving my arm at the shoulder & elbow and keeping my wrist locked so the spray gun would stay parallel to the surface I was spraying. One question I have that I haven’t seen addressed anywhere– what happens if you need to move or add electrical after this stuff is installed? I mean, ideally, you’d get it all done before that, but is there any way to run wires without opening up the wall? Anyway, yay for insulation and not feeling like you’re camping in your own house! I’m so happy you’ve been able to push forward on so many projects lately! That sounds like a good tip! 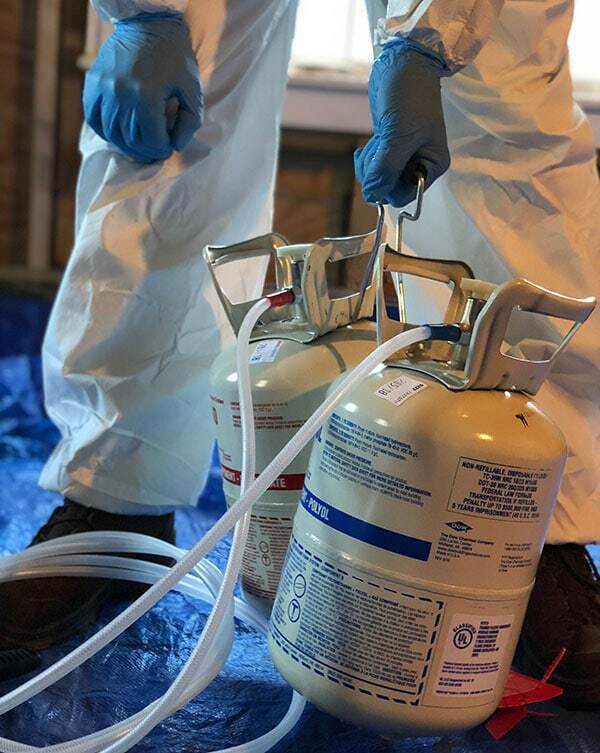 It’s similar but very different too—with the spray foam you don’t want to start and stop a lot like with a paint sprayer, and you have to fully engage the trigger for every spray. So there’s a speed factor and then with the gear you’re rather physically uncomfortable (my clothes were soaked through with sweat when I took that thing off—and I’m not someone who sweats a lot! ), which adds a challenging element I can’t totally explain. That’s a great question. First—yes ideally it’s done beforehand and doesn’t need to be changed. Partially that’s because electrical boxes are a common source of drafts, so being able to insulate around them while you’re insulating the walls is nice. If additions or changes need to be made…I’d say it depends. Since closed-cell foam is typically recessed a bit into the stud cavity, it’s possible a line could be snaked between the wall and the insulation without removing the wall. It’s also possible it couldn’t be, in which case yes you’d have to take out the wall and as much insulation as necessary to do what you need to do. To be honest that’s my biggest point of concern with it—the permanence—but at the same time I hope once this room is renovated it won’t be significantly changed for another century, and I feel better about having “permanent” foam behind my walls than a product like fiberglass for EXACTLY the reasons you describe with your existing batting. 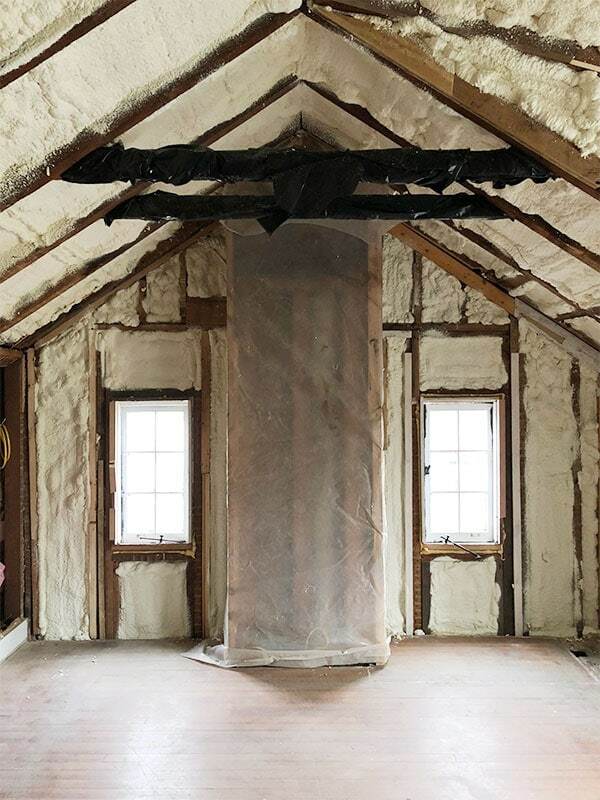 I never thought I would be so happy and fulfilled reading about a stranger’s insulation. This was such a fun post. Stay warm! Well thanks! I know it’s not the most exciting topic I’ve ever tackled so that means a lot! Couldn’t have been a better timed post! I’ve been researching and trying to figure out if this is a viable option for me. Thank you especially for the… MATH and absolutely great information. Once again, your writing style is just so great to read. Hi Daniel. I’m so excited about the potential for this room. It will make a great bedroom, you might want to move into it! We have had insulation added to our 25 year old home and it has significantly increased the winter comfort. Good luck with all the projects, I love your posts. I know!! I’m calling it a guest bedroom but I’m gonna AT LEAST have to try it out! Knowing myself I’ll probably toggle between the two just because, haha. Damn, boy! I consider myself ambitious when it comes to DIY, but you just took it to a whole ‘nother level. Well done, sir. I think that your superior attention to details just saved your life! This stuff sounds serious. Now you need a small room thermometer to get temp readings 3 times day. That is what my DH would do. 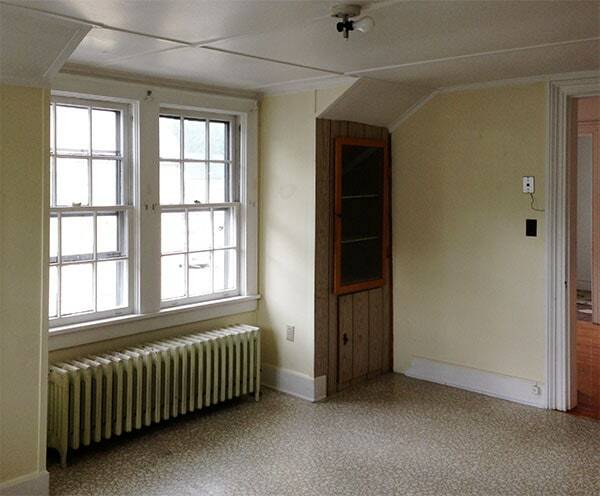 Also, you can rent this room on AirB&B(only to people that you like, of course). Anyway, great work as usual. Daniel, this is going to be a wonderful room when it’s done! Can’t wait to see what you do with it, now that it’s all snuggly and warm. I know a big problem with putting insulation in old houses is that condensation can build up in the walls. Is this not a problem with the closed cell foam? Or just not a problem with your house/climate? You are CRAZY, dude. That’s why I love your posts. 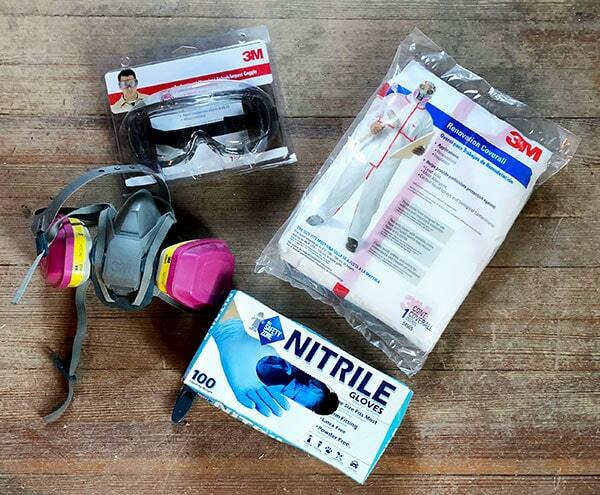 I would never brave the chemicals, hazmat suit, etc., but I so enjoy reading about you doing this. I’m knee-deep in a renovation right now and it’s so GD expensive. I budgeted twice what I thought I’d need, and I’m over. I jumpstarted it with IKEA boxes and custom solid wood doors from Scherr’s (which are gorgeous as promised), yet still I’m over. It’s my own champagne tastes and PBR pocketbook as usual. I had to have the paneled appliances, the marble slab backsplash, the brass canister lighting. 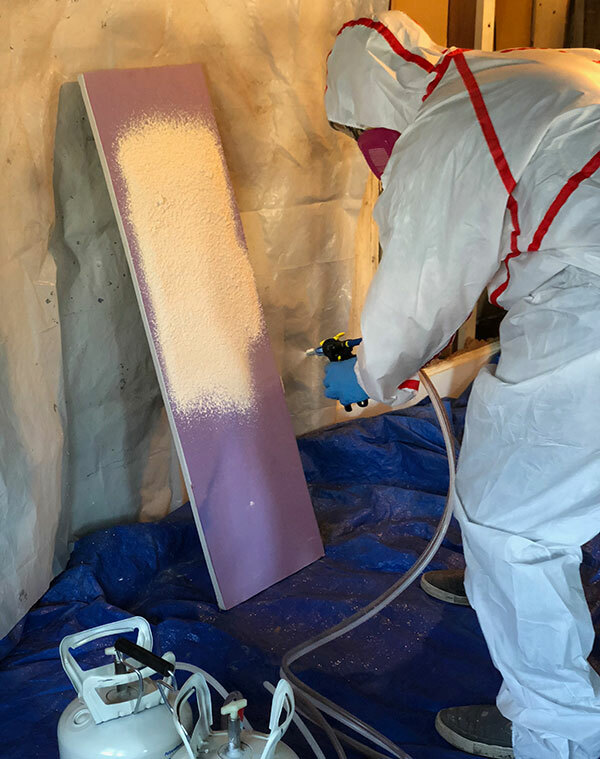 I enjoy your writing so much that I just read an entire post about spray insulation, something I personally will never do (but will probably ask my husband to)…ha! The danger of tipping tanks: generally considered to be in the same genus as tipping paint cans. The solution for both is to put said tanks or cans in a box with sides that are at at least as tall as about 1/2 or 2/3 the height of tank(s)/can(s). 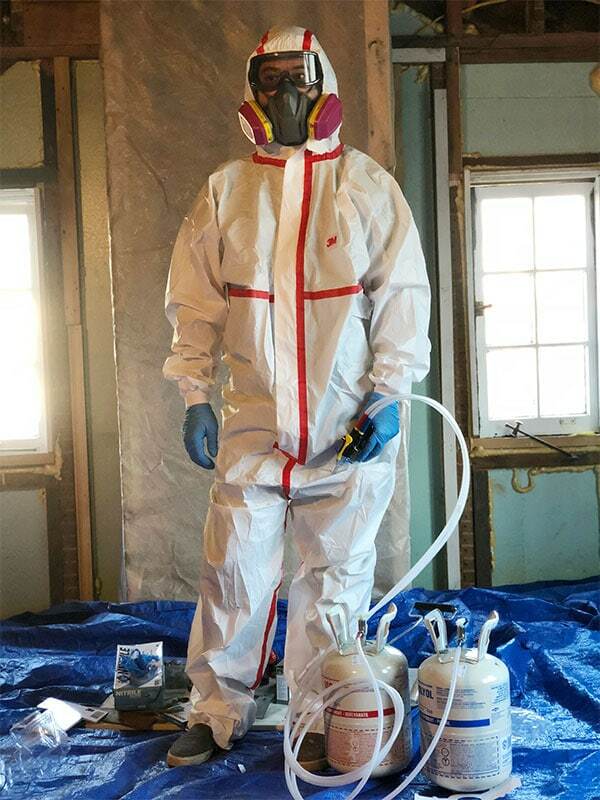 Only you can make a post on spray foam insulation interesting and amusing! Adding insulation to my attic crawlspace is on the long list of things I need to do to my house. I need to have some kind of loose material blown in to augment whatever was put up there 35 years ago (prob fiberglass batting) . My problem is heat, since I live in AZ and gets a bazillion degrees in the summer. Enjoy your now warmer home! Oh Daniel, How I can relate! We did spray (or rather attempted) in cellulose in the Domus and it was an unmitigated disaster from start to finish. I think that was the day that nearly broke us. Thankfully, we survived but never did get that house properly insulated. We never could have attempted the DIY Spray in… Thankfully, we moved to Hawaii where we don’t need to insulate from the cold! You are quite formidable! And impressive! AND funny as hell too! As always, big mahalos to you for your wit! 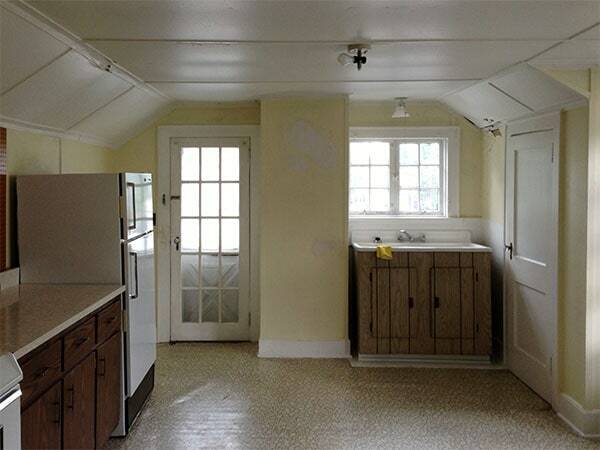 We did this exact project in our previous house, a 1920s Victorian, that had no insulation when we bought it. 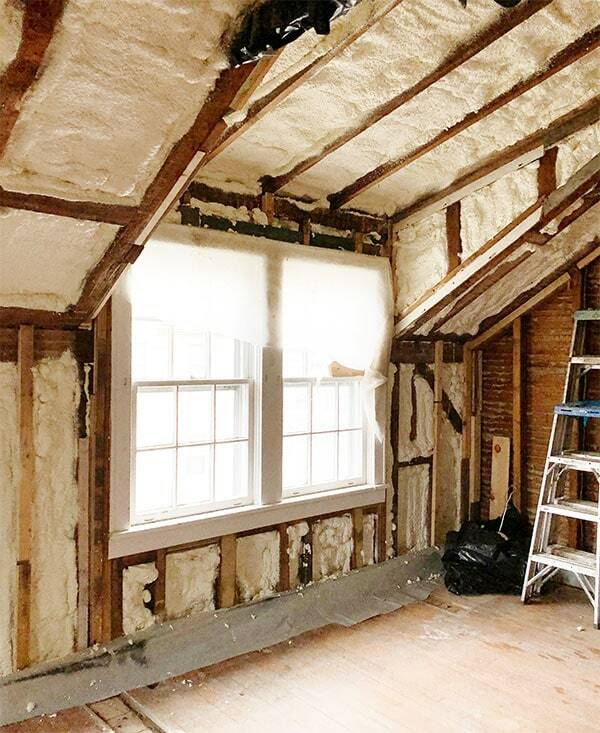 We hired a professional insulation company who blew cellulose insulation into the walls but used the Lowe’s spray foam for the attic ceiling, also pitched just like yours. We’ve since converted the 3rd floor into 2 bedrooms and a bath, and it is by far the best place to sleep in the house- so quiet and snug. You’ll be super glad you did this. We calculated that we saved a few thousand dollars by doing this ourselves. I can attest to the statements that any user definitely wants to be wearing protective gear and be careful where you spray. Our electrician/plumber worked with us on placing the can lights, outlets, pipes, and other elements so it would all last for a long time. Thanks for sharing this DIY! 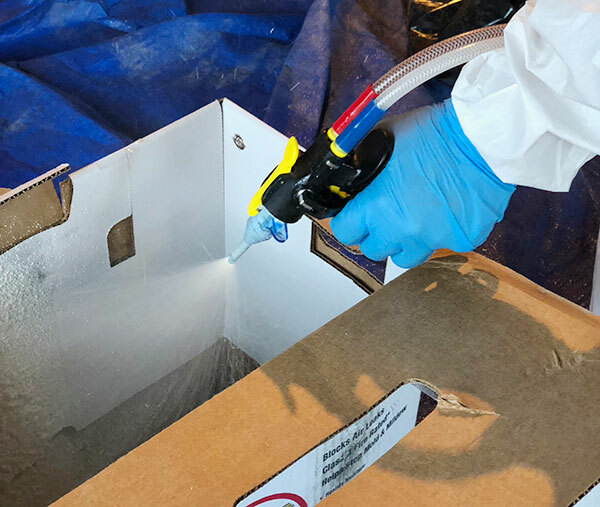 The January 2019 issue of Fine Homebuilding has an excellent descriptive article on Closed Cell Foam and the pro’s and con’s of using it. 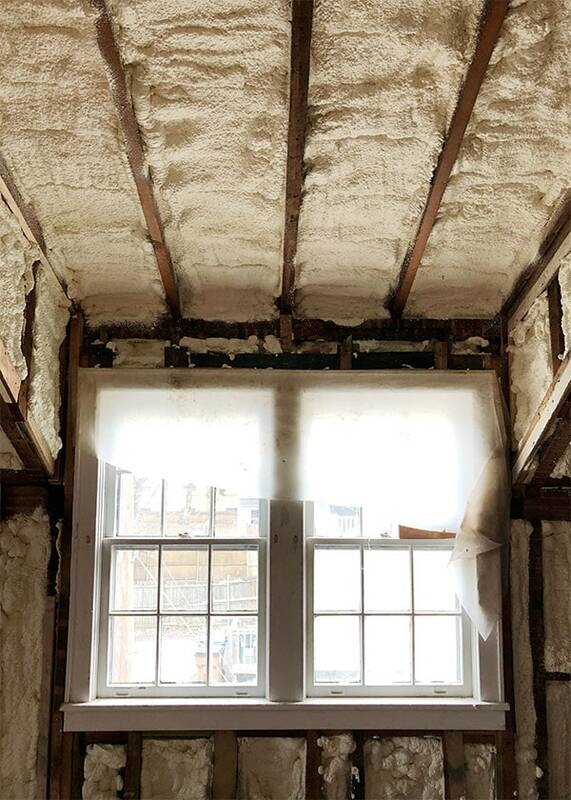 Well worth reading if considering whether to do this insulation in your own home. Link to article (free to access online) after the summary. Glad to see a post about this when it’s something I’ve been considering for awhile! Thank you, Daniel. I’ve hired out this job many times but decided to try it for myself on my current project. 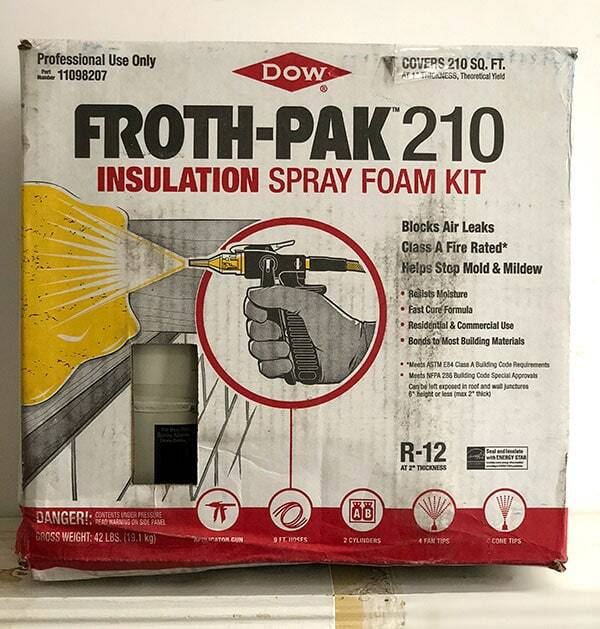 I bought the Froth Pak 200 because it was the only one my local Lowe’s store had in stock. Then I began reading the Dow online forums only to discover that the 200 Pak is for sealing only, not for insulation. Apparently it doesn’t expand like the 210 does. Anyway, before I buy the 210 I was reading the Dow forums again and discover that Dow doesn’t recommend any depth deeper than 2” with that product. This makes no sense to me, but that’s what Dow says. Even when I submitted a direct question to Dow, the same answer came back: 2” max depth, even if the first 2” has cured hard as a rock. My question, sir, is did you notice any adverse effect from spraying another layer of foam on top of the first, fully-cured layer? Good question, David! I too found this particular instruction confusing and unclear. My understanding (which may be mistaken) is that the main issue is that applying too thick of a layer in one pass doesn’t allow all of the foam to properly cure, so I aimed for about 1″ expanded thickness on each coat, giving time between layers for it to completely cure before applying more. As far as I understand, as long as that instruction is followed, there shouldn’t be an issue with adding additional layers to build up to 3, 4, or more inches thick—EXCEPT that obviously you’ll cover less square footage. I’m wondering if that’s why Dow specifies 2″, because I don’t think it really has anything to do with how the product will perform as long as you’re careful about not over-spraying in a single coat. But long story short, no, I didn’t notice any adverse effect from spraying another layer of foam on top of the first fully-cured layer (emphasis on the fully-cured!)! You seem like an lovely person with amazing taste and a great love for animals. I really enjoy your blog and insta posts and am very impressed with your capability. But I’m asking that you please research Dow Chemical before you promote any more of their products! They are evil (google napalm) and now they are merged with Monsanto, more evil. I’m only bringing this up because I’m an old hippie who has boycotted Dow since the 60’s and I was taken aback when I saw the name in your headline. Have guests? Like a person? Cracking me up. Love the content. You’re my favorite corner of the internet. ← Giveaway! Before and After! Hygge & West Home! !